If you’re looking for the custom lanyards with the best balance of good looks, durability and affordability, polyester lanyards are the answer. This workhorse lanyard style is the most popular kind we sell at The-Lanyard-Factory.com, and with good reason. They combine a classic lanyard look with modern durability and style. These great lanyards offer an unbeatable combination. They’re comfortable to wear, and made of durable top-grade polyester. The smooth surface allows custom silk screening with the same process used to print other custom items such as mugs and t-shirts. The printed image will be clear and bright, bold and legible. Available in a range of material colors, polyester lanyards are ideal for offices, schools, or businesses. Imprint them with your company logo or school mascot and help boost staff morale or school spirit. Like all lanyard styles, custom polyester lanyards can be ordered with a wide selection of attachments. Whether you need lanyards for I.D. cards, cell phones or other small items, there’s an attachment that will do the trick. Safety breakaways are a must for environments where lanyards can be caught, snagged or pulled. These essential options are always free at The-Lanyard-Factory.com. You don’t have to worry about compromising safety for cost. 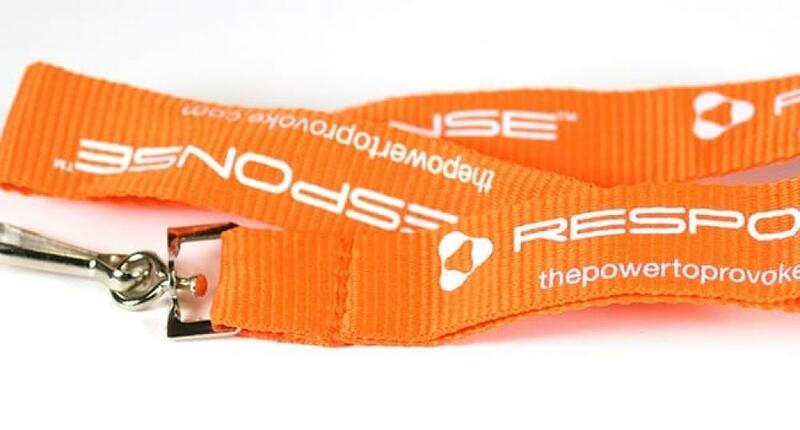 We offer a full range of lanyard styles, to fit virtually any need. Whether you need polyester, woven, nylon, tubular or full color (dye sublimated) styles, we’re here to help. We can help you design your lanyards, and with free art and revisions, you can be sure they’ll look exactly the way you want before you order. At The-Lanyard-Factory.com, we make ordering fast, easy and fun. Just fill out our no-obligation Free Quote form, call us toll free at 866-289-8828 or email us at [email protected] to find out more. We’re always happy to answer any questions you might have, and we’re here to serve all your custom lanyard needs.